What it is: a length of cable used as a noose to catch an animal – if set ‘properly’ these should merely restrain the animal until the snare is checked, but many still cause injury or death. 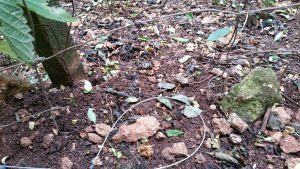 Despite there being a number of things that can be done to minimise the capture of non-target animals snares themselves are indiscriminate. Legality: self-locking snares are no longer legal, but free-running snares are i.e. 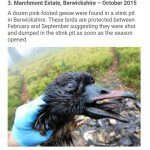 those that tighten like a cable tie “as the animal struggles” (GWCT) are not allowed, but those that will can loosen by themselves are allowed. However there are no legal definitions of either of these terms and no successful prosecutions have been brought which could clarify this. They should also be fitted with a stop to ensure they can’t tighten more than a certain amount. 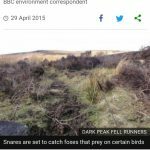 Unlike spring traps, DEFRA have no responsibility to test and approve designs and they seem relatively easy to alter even if a legal design was bought initially. Many are also homemade. Aim by legislators of the 1981 Wildlife and Countryside Act seems to have been to stop strangulation of non-target species and for snares to be used to restrain animals rather than kill them. But, of course, who is checking to ensure they’re not being set recklessly? Foxes should be killed swiftly (by rifle or shotgun) and “without undue alarm” and not be released for hunting, etc. Mainly used to catch foxes – also legal to trap brown hare in snares – and not legal to target certain animals such as deer and badgers. The law (and Codes of Practice) differ in Scotland. How they work: snares have a fairly basic set-up in that they’re essentially a noose. There are, however, a number of things that can affect how they work. They should be anchored to something solid so that a trapped animal cannot drag themselves off with the snare still attached. Long cables are more likely to cause injury to the animal when they struggle and increase the risk of them becoming entangled. 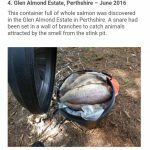 Bad maintenance or set up can cause issues such as cable breakage which can mean that a snared animal can get away from the site, snare still attached. Rust, kinks, build up of fur or plant material / soil may prevent the cable from running smoothly. Places where snares should NOT be placed include near fences and gates (as this increases the risk of fatal entanglement and non-target captures), near public rights of way – in case dogs are caught (not actually illegal if not intended but also not good for public relations), under obstructions such as low branches (where deer will duck their heads down to get underneath) and in areas where there is a high population of non-target species (e.g. near badger setts or along runs used by badgers). 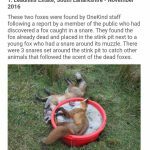 They should not be placed near rivers with otters, near places where the caught animal can fall into water and drown or slip downhill or into a hole and become strangled and, if there are muntjac in the area and no ‘prime foxy locations’ can be found, snare use should be avoided. The risk of catching badgers can be reduced by placing the loop higher off the ground. 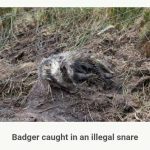 If a badger is caught other snares along the same run should be removed. The GWCT state that “humaneness and non-target issues associated with entanglement are completely avoidable” without loss of efficiency. So how come we see so many non-target animals in snares and serious injury in target and non-target species? As asked above, who is checking that snares are not being used recklessly? If you want to kill an animal and don’t care about non-target species, why bother doing things properly? Especially if you have to consider so many factors and things can still go wrong, why do it right? If an animal needs to be released, the noose can be snipped with wire cutters (not the anchor, but the loop) or, if it’s free-running, the noose can be loosened. See the advice on dealing with injured animals or call for advice before doing anything however. 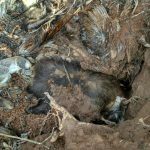 The GWCT publish good advice on how to safely remove non-target animals from snares, including badgers, and the ‘tool-kit’ which should be carried by those checking snares, just in case. 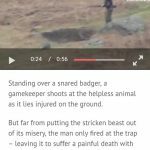 Footage filmed by HIT investigators in 2017 showing a man seemingly trying to shoot at a snare to break it shows that even simple instructions are not being followed… other footage also shows badgers being shot. If you find an injured animal, call a wildlife hospital for advice / check out our advice page – more detailed first aid advice may be added in time when a ‘protocol’ is confirmed with a local wildlife rescue we work with. 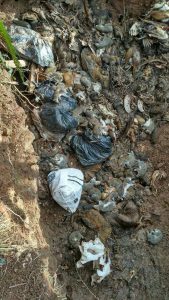 What it is: often dug by landowners and gamekeepers and filled with carcasses, fish heads, carrion and remains and innards of animals (including those caught in snares) in order to lure animals in – snares will be located nearby to catch such animals. Legality: legal to use as long as there are no remains of animals used which there are restrictions on – ‘fallen livestock’ from farms, for example. Who uses them: farmers and gamekeepers mainly. 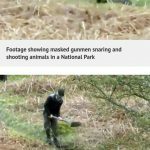 Where they are found: usually at the edge of fields, along edges of woodlands… on farmland or shooting estates. 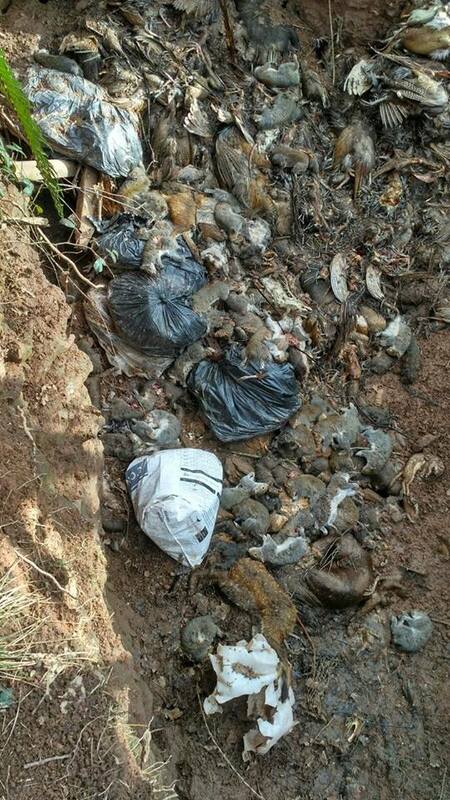 Target animals: animals attracted to decomposing flesh, usually foxes are a main target. 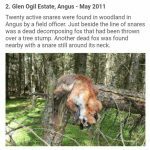 How they work: simply, the smell of decomposing flesh will attract target animals to the location where they will be caught in snares set around the pit. How you can help: as above with the snares. 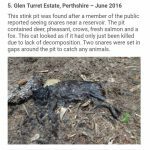 Difficult otherwise – certain animals, such as dead farm animals, legally need to be disposed of correctly and should not be used in pits – if you can stomach the smell, check to see what is being used.